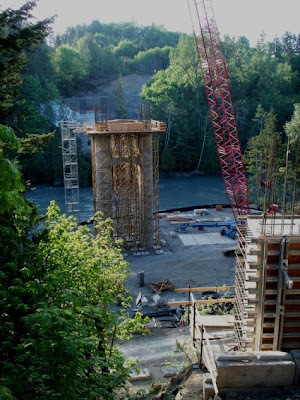 The Elwha River Bridge just west of Port Angeles is still under construction, but progress is being made. The old bridge was a landmark and beautiful in its ancient construction, but it had become unsafe and in great need of maintenance. This bridge spans the Elwha River on the Upper Elwha River Road, which connects Highway 112 and Edgewood Road. For bicyclists or joggers, watch for the day the bridge is completed, because there is a great loop if you park your vehicle at Laird’s Corner at the public parking lot, bike or jog down Edgewood, down the Upper Elwha River Road to Highway 112, and back up Highway 112 to Laird’s corner. Laird’s corner is at the intersection of Highway 101 and Highway 112. Courtesy Sequim & Port Angeles Real Estate, LLC and Photo by Chuck Marunde, J.D.